Whether you're a long-time resident of the City by the Bay or an occasional visitor looking to move in, you know how the feel of the city changes from neighborhood to neighborhood – even block to block. With every step you take, the vibrant character of the city enfolds you and informs your experiences. When it comes to choosing a home in San Francisco, the layout of your space can be as dramatic as the change from neighborhood to neighborhood. Imagine walking into your home and feeling the living room opening up around you, its window facing out over the view from one of the city's great hills, with an open-plan, and eat-in kitchen so that the whole space feels luxuriously vast. Or perhaps you'd prefer walking into a cozy reading room, set aside from the concerns of the day, and a large second bedroom appointed as a home office. The floor plan of your home controls how you move through the space, how you interact with it, and how you live in it. And as the old saw goes: when they are good, they are very, very good. And when they are bad, they are awful. Narrow entryways, rooms that aren't conveniently sized for their intended uses, or a lack of storage space that causes clutter to overflow into living areas all contribute to a cramped, restless feeling – not good, for the place you want to be able to unwind in! These days, many developers are taking the stately old Edwardian and Victorian homes in San Francisco and renovating them into something more modern. With the value placed on housing inside the city, there's often a call to make the most of a limited space, and a floor plan that emphasizes natural light and an easy flow from one area to another can make a modest home feel much bigger on the inside. Visit prospective properties to get a feel for them. Walk the routes through the living rooms and kitchens and to the bedrooms and bathrooms; imagine how furniture would look, and what space it would take up. See if there's room to stretch out, literally and figuratively, and imagine if the daily motions of your life feel comfortable in the property's layout. If they do, then congratulations: you might just have found your new home. I’ve always been curious to actually get into the nitty-gritty of the SF real estate data. 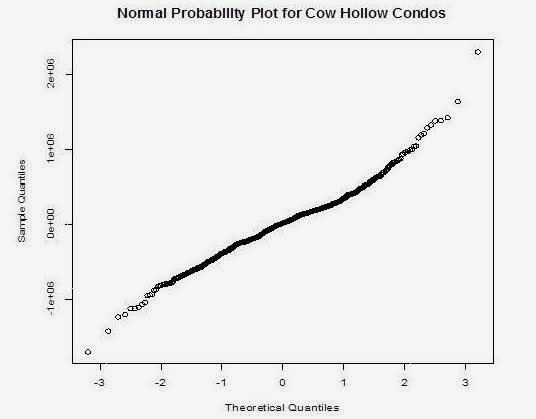 We spend a lot of time regurgitating opinions, but for once I actually went to the raw data myself: I got a mathematician from The University of South Carolina involved to conduct a study on property information, covering both the Cow Hollow and Marina Districts. This is an original piece, so I get to speak with a lot of authority here. The proximity to the median price - the number exactly in the middle - captures over two-thirds of the values of Flats, Single-Family Homes, and Condominiums in Cow Hollow. Paying attention to the median as a price proxy is, therefore, most important. It’s also a little better than talking in averages because as you see in the charts above… the data skews nicely. No surprises there. A predictor model was developed and it was discovered that square feet is a leading predictor of price! We kind of knew this all along - but now we have the evidence - that's encouraging. After making sure that bedroom and other inputs do not skew the relationship of total square feet to price - we tested for normality. 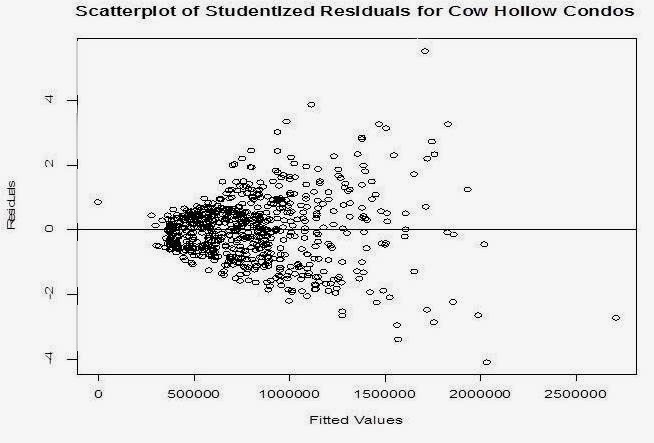 And that’s exactly what we got: the data we worked with is reliable! In English: we can trust the results. Using the above chart as an example of outcomes: what we are able to do is determine relationships between key factors of a property - number of bedrooms, bathrooms, square footage - which are dubbed “residuals” in fancy terms - and how that tentatively translates into price.